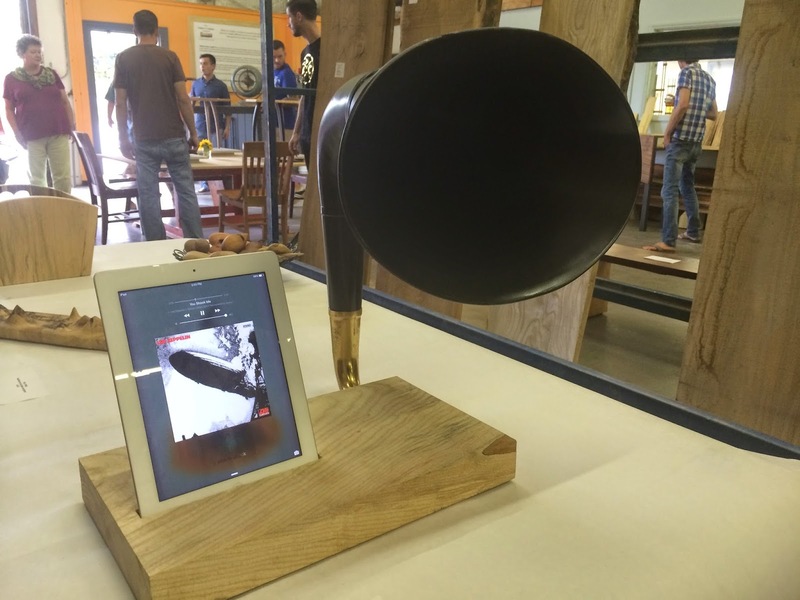 I had a really good time making this first version of a gramophone iPad amplifier, after seeing one at Restoration Hardware. I was lucky enough to find a gramophone-style horn at Stuffology in Kansas City's West Bottoms. I'm not sure what type of player it came from. It is definitely not a 'gramophone' brand, since the bottom of it is brass and has an L-shaped bend in it. This fact actually saved me considerable time and effort and tool cost when carving out the channel. To prep the horn itself, I had to cut off a horizontal bar on the front of the horn, then used my Drimel to sand off all of the old paint, then used steel wool and CLR to clean it up. I used Rustoleum Universal Paint & Primer Gloss Black.